It's time to Kick Your Fear of Video To The Curb. You do it in baby steps so that you don't get overwhelmed and want to quit before you start. This is pretty much how I got over being scared of video. If I can get over it with my anxiety disorder, so can you. Now, you can watch this video or scroll down to the transcript or do both. 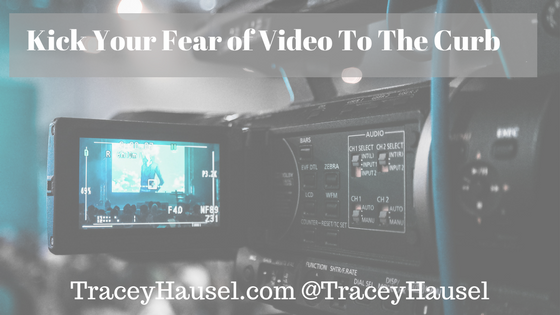 Break Through Your Fears of Video from Tracey Hausel on Vimeo. Hey, everybody. This is Tracey Hausel, traceyhausel.com, coming from to you from my home, my living room, in Wilmington, Delaware, which is about 20 minutes south of Philadelphia, Pennsylvania. Today, I want to ask you, how do you overcome your fear of doing video? I'm not going to ask you, I'm going to help you. But have you ever thought of that? You're terrified to do video marketing, and you don't know what to do about it? But you know the best way to get someone to know you is to do video. First, before she runs away, everyone … well, not everyone, but a lot of people know that my silent business partner is the second oldest of my cats, and she is Stella. Hi, Stella. Stella says hi. All right. I figured she'd run away before I got a chance to show her if I didn't do it now. Okay. How do you get over that fear? You do it in what I call baby steps, what really is a desensitization process. You do it in what I call baby steps, what really is a desensitization process. There are other terms for it, if you want to get more specifics psychologically speaking, behaviorally speaking, but you don't need to know them. All you need to know is baby steps. How do you baby step it? First, you've never done any type of video. The best thing you can do is to use screen share video. How do you do that? You can go to Jing, that's going to be less than five minutes. Jing.com is less than five … oops, I'm showing my hand, and my hand's not here. Less than five minutes, if I remember correctly. ‘ll be honest, I don't do a lot of them anymore because I do more lives and such, but I do do them. Let me tell you a little secret. I don't do a lot of editing. Why? Because I know I won't get it out if I do. I might lop off the beginning. I might lop off the end. I've yet to do one of those intro/outro deals. I'm not going to edit anything in the middle. I might restart something, and do it over. For the most part, I ain't got the patience for it and I know if I wait to edit something it will never get done. So I just don't do it. Because as Brendon Burchard says, “1.0 is infinitely better than 0.0.” Okay? You do screen share, that's your next step. That's your first step, okay? Now if you need even more than that of a baby step, don't show it to anybody. Just keep it to yourself. Delete it, get rid of it. Do that as many times as you can until you feel comfortable doing the actual process. Now mind you, you've not shown your face yet. Okay? I think Keynote, if you have a Mac … I like PowerPoint. I don't know if PowerPoint does this or not. I think Keynote, I'm pretty sure, can do a slide presentation. You can do a slide presentation and talk with that. Add audio to that. There are programs for that. Content Samurai I know was one that will do it. Me, I'd just rather pull up the ScreenFlow. Content Samurai is good in that you can just copy and paste like a blog post and put it to video. Okay, now you're doing screen share videos. You're confident. You're good. Now it's time to start showing your little face. As you can see, I didn't do my hair today. I washed it. Yay! I cleaned it. Yay. I didn't do anything else, and I did that on purpose. I wanted to show you that no one really cares what you look like. They care what you have to share with them. They care if you care about them. I care about you, so therefore, I am going hair-doneless today. Okay? Maybe I'll do it if my husband takes me out to dinner. We went out last night, so probably not. Pretend this is the video, okay? I assume you're getting it. This is hard to do when it's backward. Your picture would be that part of it. Just that small. Okay, and you can even make it smaller if you really want to. Then make it look bigger. You can make it teeny tiny, and then gradually make it bigger if you need to do that. Okay? Again, you don't have to show these to anybody if you don't want to, but get comfortable doing them. I do want you show them eventually. If you do nothing else, put them on a YouTube channel that you don't promote and so no one will see them. Do those until you get comfortable. Okay? Then, when you're a really comfortable doing that, it's time to show your face. Again, you don't have to show these. Again, you can do this in ScreenFlow. What you do is you just make yourself bigger, and you cut off the screen part I guess you could say and just make yourself bigger. You can line up, make it so it doesn't look so bad, so you look in proportion. Do those until you feel better, okay? Now, I'm going to tell you a little something. I think, and maybe just because I've done those other kinds for so long, I think doing it live is easier. Shh, don't tell anybody. I do. I really think doing it live is easier because you don't have to worry about, “Oh! I screwed that up. I have to stop. I have to start over again.” Once you screwed up, you're done! You did it. You just keep going. What I want you to do is to do those. Now what an even easier way to do it, frankly, is on your phone. Just videotape yourself on your phone. You just talk to yourself. Delete it when you're done. That's the easiest way to do those. I now have live on my desktop, so I'm doing my live from my desktop now. You don't have to do live. Just get used to showing yourself, seeing yourself, talking to yourself because that's what I'm doing essentially, talking to myself. Delete it when you're done. Eventually, you'll feel comfortable to publish those. Now maybe you might feel more comfortable starting with a live. I don't know. You do what's most comfortable for you, but don't not do it. I want you to do it. Okay? Then do whichever you felt more comfortable not doing first. Either do the live now, or do the not live. Okay, this is getting on my nerves, get out of my face. Okay, so do that. We used Google Hangouts, so we didn't have to buy anything. She said, “I'd like you to do it with me”, so I said, “Okay.” Thought okay this is a good way, and she did it on purpose so that I would come out and show my face. She did a lot of the talking, and then I'd add here and there, and I'm pretty much a straight-faced kind of person. If I have something to add I will, because I'll be honest, something I need to work on is adding some fluff. That doesn't even sound right, it's not what I'm saying, but to make what I say take longer to do it when it comes to things like webinars, blog posts, and such. I'm a get to the point, get it done kind of person, because I want to move on to the next thing that I have to do. That might be an in between step. You might want to talk your friend who does it, then you can do that. Of course, that's going to be YouTube. I will tell you, you will get trolls on your YouTube. I don't care if you have nobody who's subscribed. You'll get some idiot who will be a troll to you. Ignore them. That's the [inaudible 00:10:05] person life. They have no life. First, just show slide shares in some shape or form, or screen shares. [inaudible 00:10:19] Okay, screen shares in some form. Next, put yourself little itty bitty in the corner of the screen. Okay. Third, then you're big at the screen. At this point, you can choose to either do a non-live one or a live. Whichever is easier for you at first. Fourth, do whichever you didn't do in that step, and you're there. Now there's those little mini steps where you don't publish them. You don't share them, but before you move to the next step make sure you are sharing. You are publishing, and there you go. That is how you get over your fear. You got to make that first step. Okay? If this is something you're scared to do, and you are doing it, and you like just to have someone cheer you on. Hey! Share in the comments. Message me. I'll cheer you on. Okay? Everyone needs a cheerleader. All right, so if you want to know some more about video marketing in general, go to traceyhausel.com/video. Put your name and email in there and you'll get some training. I believe it's a PDF and a video is the training for that. As always, if you want to get in my general list, go to traceyhausel.com. Up in the right-hand column, which would be this hand, up in the right-hand column put your name, your best email, and you'll be on my list. 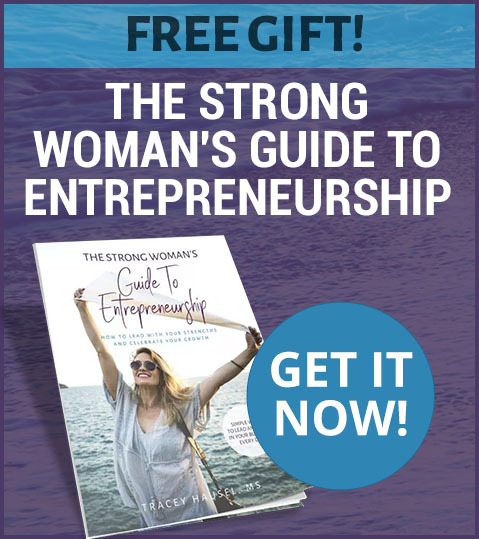 You can be on my newsletter for tips, tricks, and strategies for personal development, productivity, mindset, marketing, all kinds of good stuff. Okay? That is it for today. Tomorrow I am going out to lunch with my sister, so I plan on still doing a live, I just don't know what time it will be or what the topic will be. 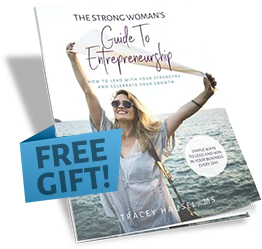 If you have something you'd like to talk about, please let me know either in the messages, email me at tracey@traceylhausel.com, or put it in the comments below. I hope you had a great time today. I'll see you next time. Bye-bye. Share with your friends on Facebook and Twitter who need a little help pushing out of their comfort zones to do video.